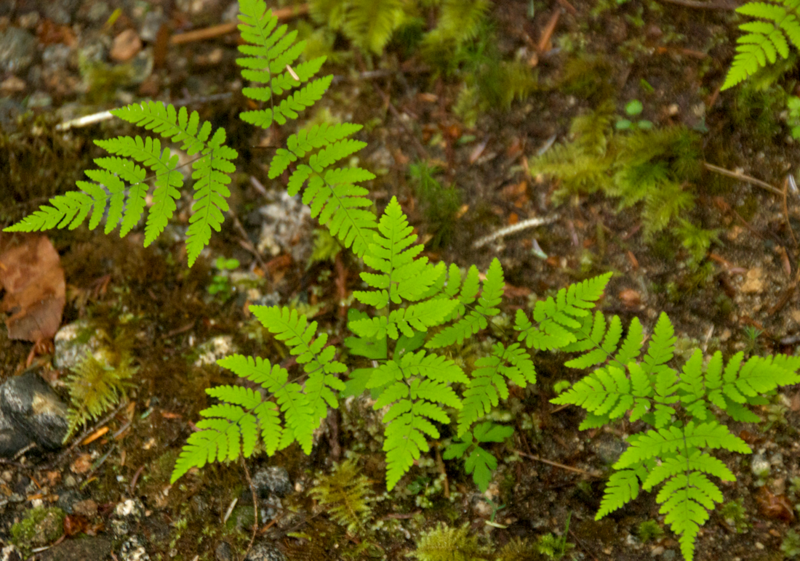 Western oak fern found in a forested area of Calvert Island. Photos by Ian Cruickshank (left) and Chanda Brietzke. 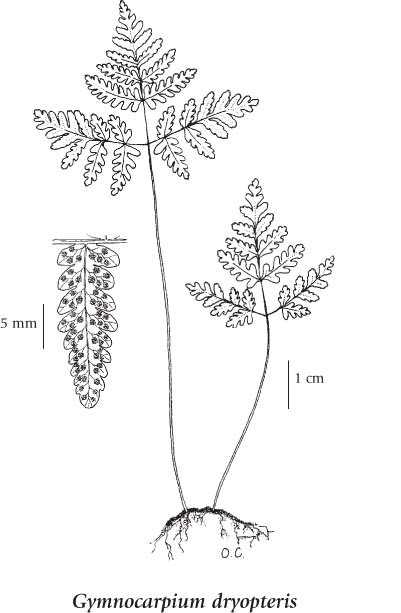 This relatively small fern grows upright to 40 cm tall, and tends to occur in large groups of individual fronds, which grow upright from long creeping rhizomes. Its tripinnate blades are triangular and approximately as wide as they are broad, with 20 pairs of leaflets. The leaflets in the largest and lowest pair are distinctively triangular compared to the other pairs. The apex of the frond, where leaflet pairs become indistinguishable, is round-toothed (lobed). The sori are small, circular, and don't have an indusium. Western oak fern grows in moist to wet forests, glades and on streambanks and can also thrive on rocky slopes. It is found from low to subalpine elevations throughout most of British Columbia except the northeastern corner of the province. Its range includes western Canada and the northwestern United States, Alaska, Kamchatka and Sakhalin, Russia. Oak fern (Gymnocarpium dryopteris) and western oak fern are distinct species according to E-Flora, USDA Plants, and the Integrated Taxonomic Information System, but are very similar and are sometimes lumped together. Gymnocarpium disjunctum was once considered a subspecies or a variety of G. dryopteris. Pojar and Mackinnon treat them as one species in a "broad, circumboreal sense" for the purposes of identification. Gymnocarpium dryopteris tends to be smaller and is bipinnate, while G. disjunctum is tripinnate. 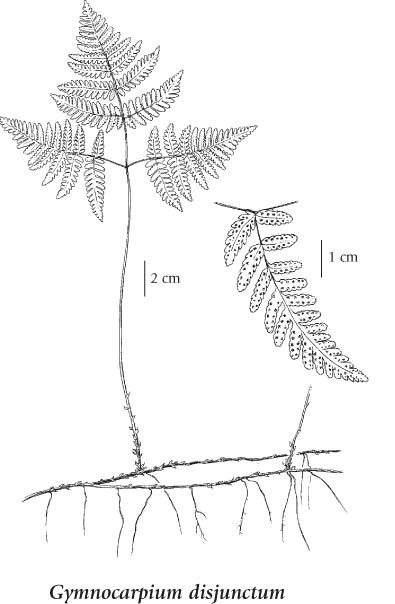 Compare leaflet diagrams of G. dryopteris and G. disjunctum to see this difference. 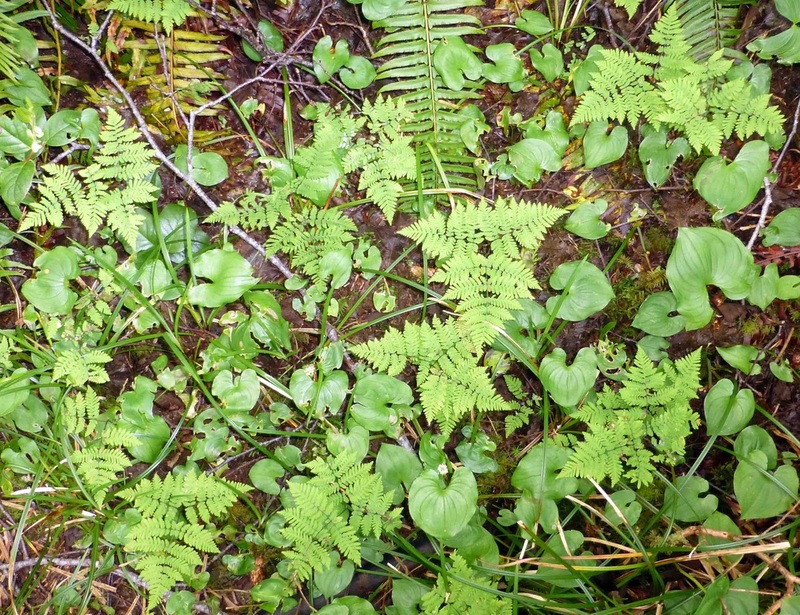 On the BC coast, western oak fern appears most similar to bracken fern (Pteridium aquilinum), which is also triangular in shape, grows in individual fronds, and is 2-3 times pinnate. However, bracken fern grows much larger (to 3 m) and has hairy leaves with rolled-under margins. Gymnocarpium disjunctum (Rupr.) Ching. In Klinkenberg, Brian. (Ed.). E-Flora BC: Electronic Atlas of the Plants of British Columbia. Lab for Advanced Spatial Analysis, Department of Geography, University of British Columbia, Vancouver. Accessed 18/03/2015. Gymnocarpium dryopteris (L.) Newman. In Klinkenberg, Brian. (Ed.). E-Flora BC: Electronic Atlas of the Plants of British Columbia. Lab for Advanced Spatial Analysis, Department of Geography, University of British Columbia, Vancouver. Accessed 18/03/2015. Pojar, J. and MacKinnon, A. (1994). Plants of Coastal British Columbia. Vancouver, BC: Lone Pine Publishing. P. 423. Bea Proudfoot, Kelly Fretwell, Ian Cruickshank, and Brian Starzomski (2015).